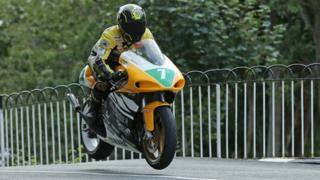 Daniel Sayle is "stable enough to remain conscious" following his crash at the Classic TT, his partner said. The 36-year-old Manxman suffered head, chest and spinal injuries in a crash at Ballaspur during Lightweight race on 25 August. Following the accident, Sayle was transferred to hospital in Liverpool. His partner Kirree Kermode posted: "Dan has become stable enough to remain conscious, although very drowsy and at times confused." "It doesn't take away from the moment he looked me dead in the eye and smiled. "I could barely see for tears but I knew then he wasn't giving up on this fight." The Sulby racer is the most successful sidecar passenger in TT history and has also won three Manx Grand Prix races as a solo competitor.